Take it Outside- You’ll love the way you feel! 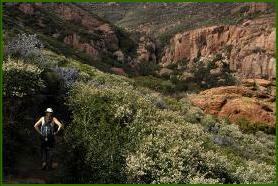 Charmlee Wilderness Park Family Hike:- This is a great hike to bring the whole family along on! The trail features gently rolling hills, wildflower filled meadows, shady oak groves, and incredible ocean views. The hike is about 2.5 miles long with plenty of options to make it shorter, or add some detours to create a longer, more challenging hike. It should take us about 1 to 1.5 hours and there are several places at the park to enjoy a family picnic. There is also a Nature Center and full bathrooms available! Back by popular demand...Our 3rd Annual Father’s Day Family Kayak Trip! This fun family adventure is a great way to celebrate an early Father’s Day with an afternoon of fun in the sun! We will start the day at approximately 9:30am kayaking on beautiful Lake Casitas, near Ojai. It will be a 1 1/2 to 2 hour guided kayak paddle (with instruction- no kayaking experience necessary!). We’ll be crossing the lake and hugging the shoreline of the island- paddling at a leisurely pace to allow time to look for birds and wildlife and to enjoy the calm morning water. After our kayak we will have a tasty kid-friendly picnic lunch on the shores of the lake, followed by an afternoon of Frisbee and other fun activities for the whole family to enjoy… or you can just relax in the sun and enjoy the beautiful scenery! We should complete our picnic early enough to allow you some time to explore the quaint shops and art galleries of Ojai. Please contact me no later than Tuesday, 5/28 if you’re interested in joining us on this fun family adventure! This trip is suitable for children 6 and over (with an adult in a double kayak) and is great chance to introduce kids to the wonders of nature and a fun new activity! This relaxing trip is also the perfect opportunity for people who are new to kayaking to experience a fun, adventurous excursion at a more leisurely pace. If you have any questions about this trip just call or email me. Please feel free to invite any interested friends along! Click here to see pictures from previous trips! Free Mountain Bike Skills Clinic! Some of the skills to be covered will be: proper seated rider position, controlled braking and slow speed technical maneuvering, pedaling cadence/gear use, and proper riding position and technique for climbing and descending. New trips are added all the time, plus trip dates and locations are subject to change, so sign up for our Events newsletter so you don’t miss out on any of the fun!! Mishe Mokwa Hike- This hike is a 6 mile loop featuring an incredible variety of terrain and amazing views across the Santa Monica Mountains and out to the Channel Islands! This is a more challenging hike with several long inclines, but the views are worth every step!! You will have a chance to stand on Sandstone Peak; the highest point in the Santa Monica Mountains, and enjoy views usually reserved for the magnificent hawks that circle overhead. We will be taking a break in a shady oak grove at the base of the canyon, so make sure to bring along an energizing snack! Click here to see more pictures from this unique hike! Beyond the Gym will be offering a variety of hikes and adventure trips this summer. Dates and locations will vary based on the weather and the groups’ hiking ability. Most of the hikes listed below are suitable for most fitness levels and take between 1 and 1 1/2 hours to complete. Please contact Debbie to get on the email list for upcoming hikes. Hike dates and locations will be announced on the Monday before the hike and you must rsvp by Thursday for a Saturday morning excursion. Hikes cost $10 per person or $15 per couple. 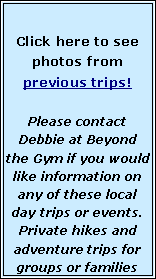 Debbie@BeyondtheGym.com.